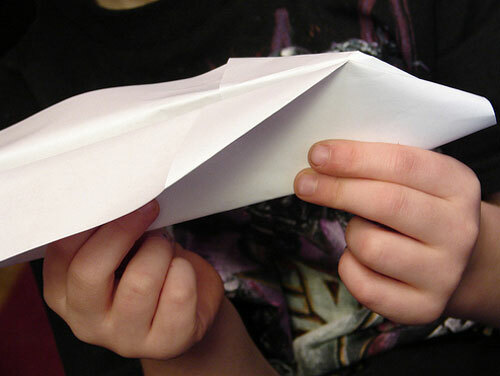 The best part about creating paper airplanes is that this “craft” wouldn’t cost you a dime. No expensive trip to the art or craft store. Almost everyone has a piece of paper. Imagine taking a fussy child and turning a scrap of paper wrangled from your purse into a moment of sheer fancy for your little one. And for you. I’m sure if you extended your arm a bit beyond your computer screen you would hit paper paydirt and with a few folds of paper be able to create something as lovely as this. I’m sure you could make a paper airplane with your eyes closed. There are many, many, many, many different ways to make a paper airplane, but have you ever thought of making them in cool colors like this? Or you can use printed paper for a bit more pop. But there is something so beautiful about the classic white paper airplane, like this one. This paper airplane is called “Jazz” and was designed by David Mitchell, featured in the paper airplane calendar. I love the names of some of the different designs. Like this one which is called the sparrow. Or why don’t you just take a moment to let your hands take the paper and let your hands remember how to effortlessly turn it into an airplane. You’ll be surprised at how good it feels to make one. When was the last time you made a paper airplane? Hopefully you’ll say today. Its funny, I think I am a pretty crafty person, but paper airplanes and I just don’t work. i think I will need to get lessons in event my next one is a boy! After reading this I was inspired to revamp my plane making skills and set out to launch a new design. The new design however would only fly in left turns. Back to the drawing board! My apologies Felix–I’ve taken the photo down. Thanks for reaching out to us. Awesome post! I am going to recruit my husband to help out with some planes. He loves making them, I love flying them!